Walt Disney's original classic Peter Pan In Return To Never Land is filled with wonder, imagination and plenty of pixie dust. Join Tinker Bell, Peter Pan and the Lost Boys, and meet Jane, Wendy's ever-so-practical daughter, who's outgrown her mother's tales of pirates and pixies until Captain Hook whisks her away to Never Land. The crafty pirate sets in motion a plot to capture Peter and Tink, whose light is fading fast because Jane doe..
Peter (Levi Miller) is a mischievous 12-year-old boy who has lived his whole life in a bleak London orphanage. Then one incredible night, Peter is whisked away from the city and spirited off to a fantastical world of pirates, warriors and fairies called Neverland. There, he finds amazing adventures while trying to uncover the secret of his mother and his rightful place in this magical land. Teamed with the warrior Tiger Lly (Oscar nomin..
Peter (Levi Miller) is a mischievous 12-year-old boy who has lived his whole life those in a bleak London orphange. Then one incredible night, Peter is whisked away from the city and spirited off to a fantastical world of pirates, warriors and fairies called Neverland. There, he finds amazing adventures while trying to uncover the secret of his mother, and his rightful place in this magical land. Teamed with the warrior Tiger Lily (Osca..
A magical and new take on the classic kid’s story following the adventures of Captain Hook, Peter Pan, Tinker Bell, Wendy, Michael, John and the Never Kids. Neverland is in great danger when the famous Never Book falls in the hands of the crooked Captain Hook. Will Peter be able to fulfil the fabled prophecy of the Never Book, with the help of Tinker Bell, Wendy, Michael, John and the Never Kids? Will he be able to save Neverland and Lo..
PETER PAN: Let your dreams take flight with the film that taught us to believe, Walt Disney's Original Classic, Peter Pan. 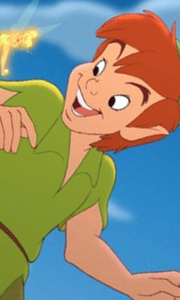 Bursting with fantasy, adventure, memorable characters, music and pixie dust, Peter Pan soars to new heights. Fantastic adventures await Wendy and her brothers when Peter Pan, the hero of their stories, whisks them away to the magical world of Never Land. After following Peter and his feisty sidekick Tinker Bell pas..
Let your dreams take flight with the film that taught us to believe, Walt Disney's Original Classic, Peter Pan. Bursting with fantasy, adventure, memorable characters, music and pixie dust, Peter Pan soars to new heights. Fantastic adventures await Wendy and her brothers when Peter Pan, the hero of their stories, whisks them away to the magical world of Never Land. After following Peter and his feisty sidekick Tinker Bell past the "seco..
Re-discover the timeless story of Peter Pan as you've never seen it before and be swept off your feet to a Neverland you'd never dreamt possible. Magic, adventure, flying, swashbuckling action and amazing special effects: this feature film version of Peter Pan by critically acclaimed filmmakers has got it all. Join the boy who wouldn't grow up and Wendy, the girl who is told she has to, in their adventure against Captain Hook and his pi.. It Will Live In Your Heart Forever. Let your dreams take flight with the film that taught us to believe, Walt Disney's Original Classic, Peter Pan. Bursting with fantasy, adventure, memorable characters, music and pixie dust, Peter Pan soars to new heights. Fantastic adventures await Wendy and her brothers when Peter Pan, the hero of their stories, whisks them away to the magical world of Never Land. After following Peter and his feisty..